What Exactly is the DNC, and What Can Individuals Do to Change the Party's Future? The day after Donald Trump was elected President of the United States, filmmaker Michael Moore took to social media to post his thoughts on how Democrats could move forward. Number one at the top of his “Morning After To-Do List” was, “Take over the Democratic Party and return it to the people. They have failed us miserably.” It was (and remains) an interesting idea, and one that clearly appealed to the 214,431 people that have since shared the message. Numerous other pundits, from The Young Turks to the gents over at Keepin’ It 1600, have mentioned tearing down the DNC or getting active in the fight for the party’s future. But just how can individual citizens become involved in the movement to steer the ship in the right direction? To answer that question, it first becomes necessary to understand just what the DNC does and how it works. What is the Democratic National Committee and what does it do? The DNC is the official governing body of the Democratic Party. It coordinates the party’s overall strategy to support Democratic candidates in local, state, and national elections, helps devise the party platform, and organizes the Democratic National Convention once every four years. How many members are there in the DNC and who are they? How did they get to their position? If you want the line-by-line explanation, you can read the party’s charter and bylaws. If you’re not inclined to read many pages of legalese, the basic answer is that there are a number of ways individuals can become a part of the DNC. So over 400 people are in charge of determining the Democratic Party’s policy? Not quite. The DNC is led by an executive committee, that includes the party Chairperson, five Vice Chairpersons, a Treasurer, a Secretary, and a National Finance Chairperson. Other “appropriate officers of the National Committee,” such as Communications Director or Executive Director, can also be included. The Chairperson is either selected by a sitting Democratic president and then endorsed/not endorsed by the party, or elected by a vote within the DNC. 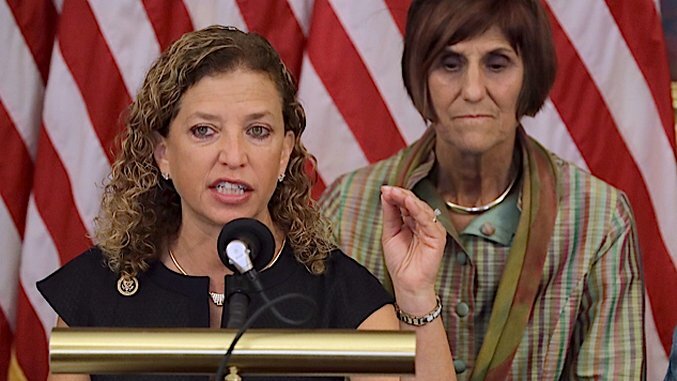 Current Chairwoman Donna Brazile was appointed to the position on an interim basis after previous Chairwoman Debbie Wasserman Schultz (confirmed as chair in May 2011) resigned prior to the 2016 Democratic National Convention. When is the next election for chairperson and how will it work? The next DNC election has not yet been scheduled, but will likely be held in February or March 2017. The new chairperson will be elected by a majority vote. If, after three ballots, there is no majority, then the the candidate with the fewest number of votes will be eliminated from contention. This process will continue until a majority choice exists. Who is already a candidate and/or who is likely to run? There have already been a few names thrown out there. Representative Keith Ellison, the co-chair of the Congressional Progressive Caucus, has announced his intention to run and has been backed by Vermont Senator Bernie Sanders. Former Vermont Governor Howard Dean has also thrown his hat into the ring to take over the position he already occupied from 2005 to 2009. According to CNBC, other contenders include current Labor Secretary Tom Perez, former Maryland Governor Martin O’Malley, South Carolina Party Chair Jaime Harrison, New Hampshire Party Chair Ray Buckley, and Missouri Secretary of State Jason Kander. If it’s a closed election, then what can I do to play a role? One obvious answer is to join your local Democratic Party so as to stay abreast of developments within the DNC. You can also sign one of the online petitions potential candidates could use to gauge support (Ellison has already received over 250,000 signatures) or write letters to any of your local, regional, or national officials. Below is a list of some of the various member organizations within the DNC, as well as links to their respective websites or contact forms. If there’s one thing that’s certain, it’s that no one within the Democratic Party has all the answers at present. By all accounts, opinion within the DNC on how best to proceed is about as divided as it can be, with no one viewpoint prevailing over others. A sustained letter writing or petitioning campaign from concerned citizens could certainly work to push the needle in one direction or another. So, if ever there were a time to make your voice heard, it’s now.